Here is another blog from the November 2011 update to the Social Flooring Index for you to check out: Armstrong Flooring's The Floor Board Blog. The Floor Board Blog was launched on June 30th, 2011 and publishes once per week. The primary contributor to The Floor Board Blog is Kim Lefever, Armstrong's Social Media Manager. However, - and here's what I love about this blog - 13 Armstrong employees contribute to the blog as you can see from the Author Bios, all of which include interesting personal details! Notice, too, in the blog header photos of three of the blog contributors. These are real people writing. Fantastic! 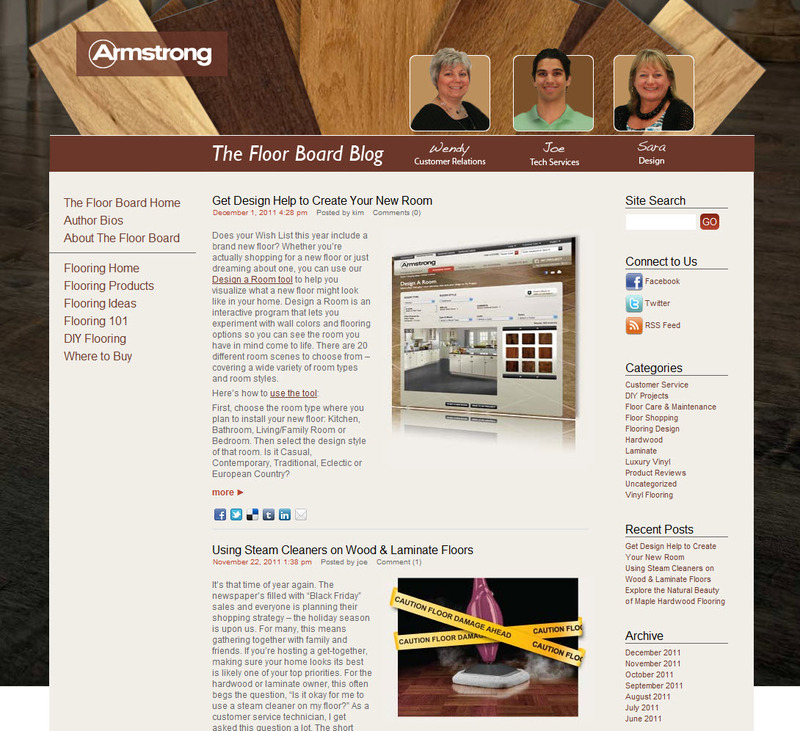 The Floor Board Blog sidebar includes ArmstrongFloor's Twitterstream and a link to Armstrong's website demonstration on YouTube. You'll also find links to its Facebook Fan Page (2k+ fans) and to Twitter. In the blog comments, on Facebook and Twitter, you'll notice good interaction with readers, fans and followers. The blog articles are informative, helpful and real. Add email as a subscription option in addition to RSS. Include photos of each of the blog contributors ideally on the author page with a link to each's blog articles and/or at the bottom of each article by the bio. Link to outside content. Every blog article links internally to Armstrong web content. Consider venturing out. For example, Paul Anater from Kitchen and Residential Design [listed in the Social Flooring Index] refers to Armstrong flooring products in The Case for Linoleum and Vinyl floors on Houzz. Why not refer to that content and to him? It makes for a richer reader experience and supports those who are getting the word out about Armstrong products. Great Job providing homeowner flooring guidance, Armstrong! I look forward to reading more. What do you like most about Armstrong's The Floor Board Blog?